If showers are our sanctuary, then the shower head will be its holy fountain of blessings. It has the power to wash away all the tiredness and negativity you had to deal with all day. But what if you get in to take a shower one day and the shower head just starts to spit water from every direction right on your face, making you more pissed. 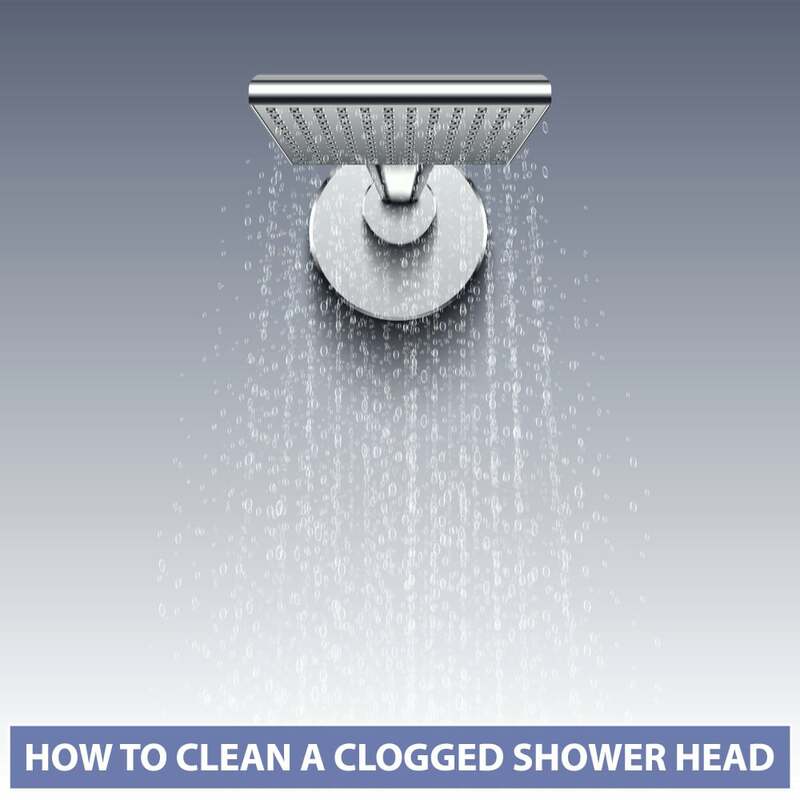 This irritating phenomenon happens because of a clogged shower head. The holes of the shower head get blocked by the mineral components mixed in the water, give it enough negligence, and in no time grimes, and lime scales will get piled up on the holes and start shooting water on your face, along with the reduction of water pressure. Hard water causes mineral deposits to form faster. Water from local water supply usually contains contaminants like chlorine, magnesium, lead, calcium, etc. they are the culprits of your shower head getting clogged. If you want to enjoy a refreshing shower cleaning shower head at least once a season is a must. Now, if you’re sweating yourself over how to clean shower head holes, don’t worry, I’m here to tell you all about it. Vinegar is a popular solution when it comes to cleaning grimes caused by minerals. It is a mild acid that triggers a chemical reaction and happens to dissolve the limescale, stain and other dirt. It is non-toxic and disinfects shower head with leaving neither harsh fumes nor stains. First, remove the shower head with the help of a wrench. Be careful not to damage its finish. Take a bowl and put the shower head in it, pour as much white vinegar needed to submerge the top of the shower head completely. Leave it for about 20 to 25 minutes, if the shower head is more soiled, that half an hour wouldn’t suffice then you can wait as long as you see fit to ensure a satisfying result. If the shower head doesn’t have hard stains, use vinegar mixed with a part of hot water. Wear a pair of gloves and take the shower head out of the mixture. Most of the dirt should come loose by now, to be sure that it is cleaned thoroughly, take an old toothbrush and start scrubbing the holes of shower head inside out. Focus on the place that has the most build up and thoroughly brush it. Rinse it off with hot water. Do the scrubbing process all over again if you are not satisfied with the cleaning. Finally, grab a towel or any soft cloth to soak the excess water from the shower head and reattach it to the shower arm. Allow the shower head to run for a few minutes after you have just attached it. It’ll flush out any vinegar residue left behind and will also get rid of the smell of the vinegar. If your shower head is not removable, then don’t be down another way is open for you guys. It’s not that tricky, so chill. I’ll explain the method as easily as I can. Take a plastic bag and fill it up with enough white vinegar to get the face of the shower head completely immersed under the liquid. Stick the bag over the shower head tightly with an elastic rubber band, so the head goes under the liquid. Leave it to soak for a time according to how dirty it is. After the waiting, get it out and then the process is as before. Scrub the places with still mineral build ups left and when you’re finally done rinse the dirt off along with the mixture. Let the shower head run for some minutes to get any left up grime or mixture out of the shower head. Vinegar is quite cheap but serves you with the best result. And notice that, how less effort it requires, you don’t need to tend to it the whole time, the vinegar will do most of the job. If you don’t have white vinegar, using any other high potency type vinegar such as apple cider vinegar will do the job just fine. What’s on top of it, you may think vinegar will smell, but in reality, it doesn’t! It will smell a bit temporarily, but eventually, it will fade away in no time. Baking soda is more like the secondary weapon to use to de-clog a shower head. But they are proven quite strong to remove stubborn stains, lime scales, etc. there are a lot of ways to use baking soda to your advantage in cleaning. Removing the shower head is recommended because the whole cleaning method is done by hand, it’s going to be tiresome if you had to spend the entire time on your feet to try to reach and clean the shower head. Scrub the clogged holes with a sponge or scrubber first, so that big solid crunches of debris come out first and you won’t have to deal with them later. Take a bowl and fill it with baking soda, then add just enough hot water to form a paste, if it gets too light and watery, add more baking soda. Put on gloves before you start applying the paste over the clogged parts of the shower head. Carefully cover the holes with the paste, and leave it for about 15 to 20 minutes, giving it more time isn’t recommended, since the mixture gets harder to wash off when you let them sit for long enough. Now for the hard part, use an old toothbrush to forcefully scrub off the limescale and mineral deposits sitting on the holes. This step will take up most of your time, but the outcome will be worth it. Rinse the head with hot water and see if there is any left, if there is, then brush them again, repeat this until all the holes have opened up. Wipe the water off with a towel and if you had to remove the shower head then connect it again. Let it run and see if it’s working up to your expectation. Or you could use baking soda to clean scum that vinegar couldn’t clean. Apply the paste of baking soda on vinegar cleaned shower head, wait for the dirt to come loose, you’ll know, it will look muddy, scrub them away with a brush or a rag. Wash the shower head with hot water thoroughly. Allow the shower head to run for a bit of time and notice the difference in pressure. CLR is a leading product that is specially designed to clean calcium, limescale, and rust. If you are reluctant to use vinegar, baking soda, etc. kitchen products, CLR can save your shower head from being eaten away by mineral and lime deposits. First, take a bowl large enough to get the shower head to go in, fill it with equal parts of water and CLR solution. Mix them well. Dip the shower head under the solution face down, and wait for two minutes. Remember that CLR is powerful; waiting more can damage the finish of the shower head, and lose its shine. Draw the shower head off the bowl and dump the solution down the drain. As I said before, the acid is an active one, so if you’re a bit careless accidents can take place so dispose of them, better safe than sorry. Put on gloves and face mask to protect yourself from harsh fumes. Use a stiff bristled old toothbrush to scrub the build-ups and rinse it off with warm water. Hold it under a water faucet to see if all the pores have opened if you find any still clogged up, use a pin to open it up. Later, wash it off thoroughly; wipe the water with a towel. After connecting it to the shower arm, let the water run from the shower head to flush residues out. Even though this method is very effective and will also take up less of your time, but it is still suggested that you use natural cleaners like vinegar or baking soda, which is a lot milder than CLR. What is the use of buying expensive high pressure shower head if you don’t clean it regularly and it gets clogged, interrupting the flow of the water? None, right? You wouldn’t want a pricey junk for yourself, but if you clean regularly, any type of shower head can work decently. So once you’ve de-clogged your shower head mark the calendar for the next time and follow it. If you don’t let dirt build-up it will be a lot easier to clean and needless to say, the shower head will always look pretty and new.